No one has ever been convicted of murdering a home worker. Five mysterious deaths took place in different parts of the capital city last month. All of the deaths took place in middle and upper-middle class homes of the so-called well-to-do families. And all of the victims were the poor, helpless modern day slaves of our society the silent, overworked and underpaid home workers. The news of their deaths went amazingly unnoticed, taking up little columns of our cold, morning newspapers. The most shocking incident took place at the New DOHS home of Shila Islam. Shocking not only because of the circumstances of the death but also because Islam happens to be one of the very respected members of our educated society. 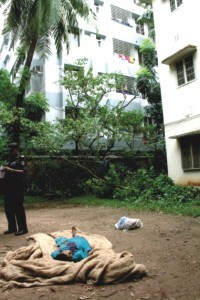 A teacher of General History at the Eden Women's College, Shila Islam brutally murdered 50-year-old home worker Fatema Begum on November 30, 2006. The reason for her wrath was chillingly simple she had failed to serve her mistress' breakfast on time! In an attempt to cover up the crime Shila in collusion with her husband Tajul Islam stuffed Fatema's dead body into a car and was on their way to Joypurhat, the home district of Fatema. Shila Islam's neighbours tipped off the police who then ordered him over cell phone to return to Dhaka. There were several injury marks all over her body. Shahjahan, another house help at Shila's house, told the police that Shila beat up Fatema on Thursday morning as she delayed preparing breakfast. Shila also admitted that she sometimes beat Fatema as she was not regular in her work and had a stealing tendency but denied the allegation of murder. Family sources claimed that Fatema committed suicide by hanging herself from the ceiling fan. Another home worker, 17-year-old Arefina Akhter allegedly killed herself by hanging herself from the ceiling fan of their house in sector 4, Uttara. According to Investigation Officer Sub Inspector Abbas, Engineer Golam Mostafa, the owner of the house after discovering Arefina hanging from the ceiling fan took her to a hospital in Sector 6, Uttara where she was declared dead. Police then sent her body to Dhaka Medical College Hospital for an autopsy. The post mortem report confirmed her death from hanging. But what led such a young girl to take her own life? SI Abbas confirmed that no one else working in that house. So it can assumed that she had to do all the work in that house by herself. So was it the work pressure that got to her? Was she getting lonely in the house? Was she allowed to go out and interact with other people? What was her life like? Arefina, in her death has buried the answers to all these questions in her grave. On December 9 two more home workers allegedly killed themselves in two different incidents. 10-year-old Rokeya Akhter, a home worker at the house of Advocate Mizanur Rahman, fell down from the rooftop of a five-storey building at Khilgaon. 15-year-old Salma Akhter at the house of Peter Mark Gomej, was found hanging from the ceiling fan with a scarf at his house at East Razabazar. Another teenage home worker's body was discovered by police in a car on Uttara Road late at night on December 26 to an unknown place in an attempt to hide it. 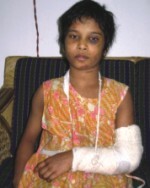 16-year-old Swapna Akhter had been working in a house in Uttara for four years. Anju-manara Khan Koli, her employer admitted that Swapna banged her head against the wall while she was beating her as she did not add enough sugar to her tea and did not do household chores properly. According to morgue sources at the DMCH, Swapna died from a brain haemorrhage. As Swapna died on the spot following the incident, Koli, along with her brother-in-law Zahirul Haq hired a car and was on the process of dumping it in a faraway place. Uttara Police stopped the car on suspicion and discovered the body. It is difficult to estimate the exact number of underage workers working at homes all across the capital city as there are no official government data on it but on the basis of a survey conducted by SHOISHAB Bangladesh in 2000 of 10,000 middle-class households there were around 300,000 child home workers in Dhaka alone. Ensuring the rights of these children is beyond anyone's reach as there is no scope for official accountability. Although almost all forms of labour are under the jurisdiction of trade unions, no such unions exist for home workers. Most of these home workers are completely illiterate which make them easy targets for exploitation. Parents of these children (most of whom are girls) are usually the poorest of the poor who give up their children thinking that it is a safe place for them to work (as opposed to working in garment factories or shops) and also takes the burden off them for another mouth to feed. The children have to do back-breaking work from very early in the morning to very late at night with very little free time, and virtually no scope for education. They are abused, verbally and physically, by all members of the family. The males of the family sometimes take advantage of their vulnerability to exploit the girls sexually. And many like Fatema, Arefina, Rokeya, Salma and Swapna become part of the statistics of never-to-be-convicted murderers. According to a study conducted by labour rights group The Bangladesh Institute of Labour Studies (BILS) at least 17 per cent of home workers in the country are subjected to sexual abuse while 47 per cent of them are assaulted physically every year. 63 per cent of home workers were forced to work 'beyond their physical abilities'. Most have to work long hoursbetween 12 and 18 hours a day - for little pay. 83 per cent of them were mercilessly scolded even for small mistakes, 40 per cent of them felt insecure while 68 per cent suffered from depression. From different national newspaper the study also found that between September 2000 and September 2004 97 home workers were brutally tortured (severely beaten up, poured hot water on, scalded with hot iron or injured with a sharp object), 139 were killed, 40 were raped and nine went missing. But these are just the official figures. The truth is that every moment of every day hundreds of thousands of poor, helpless home workers are emotionally and physically abused with no hope for justice, or any form of respect. No one has ever been convicted of torturing or killing a home worker. The killers are the rich and powerful of the society for whom all forms of justice has a price, and the price for killing a poor home worker does not even reach six figures.